On a mission to capture or kill notorious Taliban leader Ahmad Shah, Navy SEAL Marcus Luttell and his team fight for their lives. 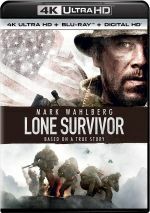 Based on real events, 2013’s Lone Survivor takes us to Afghanistan circa 2005. 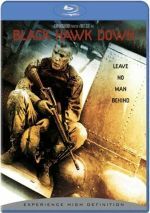 A four-man Navy SEAL team led by Mike Murphy (Taylor Kitsch) goes into the mountains on a mission to take care of Taliban operative Ahmad Shah (Yousuf Azami). Along the way, the SEALs encounter goatherders and they spare the locals’ lives. This backfires, as one of the Afghans notifies Taliban leaders about the presence of the soldiers. As a result, the SEALs find themselves in a battle to stay alive. Does it count as a spoiler to reveal they don’t all make it? Given the movie’s title, probably not. The fact the film’s name tips off viewers to the inevitable fate of some participants doesn’t really act as an impediment here, though – and not just because the factual basis of the story means some will already know how it ends. A movie such as Survivor depends more on the journey than the conclusion, so it may lack some suspense but that doesn’t seem all that important. The question becomes whether or not Survivor does much to stand out in a crowded genre. After all, war stories are a dime a dozen – do we find anything new or different here? Not really. While well-executed, Survivor fails to create an effort that differentiates itself from its peers. As I write this in summer 2018, Mark Wahlberg and director Peter Berg have collaborated on three released films. In addition to Survivor - their first team-up – they worked together on 2016’s Deepwater Horizon and 2017’s Patriots Day. August 2018 brings Mile 22 and apparently Berg/Wahlberg are in pre-production for Wonderland. I’ll be curious to see the upcoming Berg/Wahlberg films because their efforts improved over time. Horizon tops Survivor, and Day beats Horizon. All of this may imply that I don’t like Survivor, but that doesn’t stand as accurate. At its best, the movie offers an emotional, dramatic look at a certain form of warfare. And even with the “spoiler” implied by the title, the movie plays out in a fairly tense way. Yes, we know only one person will make it out alive, and even if the laws of Hollywood billing didn’t imply that person’s identity, the film’s opening scene tells us. Like I said, Survivor is more about the journey than the destination, so the inevitability of the finale doesn’t become a negative. One could actually argue our foreknowledge of the participants’ fates makes the movie more anxiety-provoking, since this gives us a sense of foreboding that otherwise wouldn’t exist. The battle scenes fare nicely, as they bring us into the action and show us the challenges faced by the SEALs. Berg doesn’t spare us the brutality and he forces us to endure the pain along with the soldiers. And yet, Survivor still doesn’t manage to elevate its genre. The movie simply comes with too much “standard fare” to become something truly special. This means we get the usual basics about the characters, and their plot points follow trite paths. Prior to the mission, we see them josh around and glimpses of home life, all of which appear in many, many films of this sort. Because we barely know the characters, we get little to differentiate them. For the most part, they come across as generic soldiers without a lot of distinctive personality traits to separate them from each other. Despite these issues, I do think Lone Survivor brings us a generally impressive war movie. It’s just not one I believe rises above its genre to turn into something especially distinctive. Lone Survivor appears in an aspect ratio of approximately 2.40:1 on this Blu-ray Disc. This became a strong presentation. Except for some archival footage seen on occasion, sharpness seemed solid. The movie offered very good delineation, with nary a soft spot to be found. No signs of moiré effects or jagged edges materialized, and edge haloes failed to appear. I also didn’t see any print flaws. Like most films of this sort, Survivor opted for a fairly orange and teal feel, though it leaned more toward the green side of the street. The hues came across as intended and seemed positive. Blacks looked dark and tight, while shadows looked smooth and clear. Everything about the image satisfied. As for the film’s DTS-HD MA 5.1 soundtrack, it added strong involvement to the experience. With the level of bombast expected from a movie with many scenes of combat, the soundfield used the various speakers well. Obviously, battles proved the most involving, as they engulfed the viewer with the sounds of the setting. That side of things worked best, but other sequences also seemed quite good. Even quieter sections placed the viewer in the action and consistently satisfied. Surround usage was pleasing throughout the film, as the back speakers bolstered the various settings well. Audio quality was also good. Speech appeared natural, and the lines never demonstrated intelligibility problems. Music was dynamic and lively, as the score showed excellent range and delineation. Effects were also bright and bold, with nice low-end to boot. Across the board, this was an excellent track that deserved a solid “A-”. The package includes six featurettes, and these open with Will of the Warrior. It goes for 28 minutes, five seconds and offers notes from former Navy SEAL/author Marcus Luttrell, mother Holly Luttrell, childhood mentor Billy Shelton, writer/director Peter Berg, Matt Axelson’s parents Corky and Donna Axelson, Danny Dietz’s parents Dan Dietz and Cindy Dietz-Marsh, Mike Murphy’s parents Daniel and Maureen Murphy, former SEALs Mark Semos, John Hoffman, Brian Call, and Chris Caracci, and actors Ben Foster, Emile Hirsch, Taylor Kitsch, and Mark Wahlberg. “Will” looks at Luttrell’s military experience as well as his involvement in the film and other production elements. It’s nice to meet some of the real-life people connected to the movie, but “Will” tends to act more as a declaration of the flick’s commitment to authenticity than anything else. With Bringing the Story to Light, we get a four-minute, 44-second reel that includes Berg, Marcus Luttrell, Wahlberg, Foster, Hirsch, Foster, Kitsch, and producers Sarah Aubrey and Randall Emmett. “Light” discusses the project’s path to the screen and related elements. Like “Will”, praise for the movie’s commitment to accuracy dominates and leaves this as a self-congratulatory piece. As expected, “Firefight” examines the movie’s major action sequence. While we get a few good shots from the set, we mainly hear self-praise for how real and accurate the film is. In Learning the Basics, we locate a six-minute, two-second program with Hirsch, Wahlberg, Berg, Aubrey, Emmett, Marcus Luttrell, Kitsch, Call, Foster, Hoffman, and Caracci. “Basics” examines actor training and delivers another show short on substance but high on self-plaudits. Split into four parts, The Fallen Heroes of Operation Red Wings takes up a total of 16 minutes, 18 seconds. It breaks into “Michael Murphy” (3:55), “Matthew Axelson” (3:35), “Danny Dietz” (3:43) and “Tribute to the Fallen Heroes of Operation Red Wings” (5:05). Across these, we hear from Berg, Daniel and Maureen Murphy, Kitsch, Marcus Luttrell, Donna and Corky Axelson, Foster, Cindy Dietz-Marsh, Dan Dietz, Hirsch, Michael Murphy’s brother John Murphy, and Danny Dietz’s sister Tiffany Bitz. “Heroes” looks at the men who died during the events depicted in the film. That’s a worthwhile subject to discuss, but unfortunately, “Heroes” falls victim to the same hyperbole heavy/substance lacking tone of the other featurettes. Rather than learn much about the deceased soldiers, we hear more about the movie’s desire for authenticity – and “Tribute” just throws out pictures/names with nothing more informative than that. Wouldn’t a real tribute give us some insight about the men? 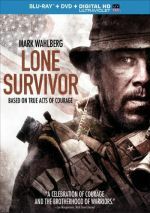 Finally, The Pashtun Code of Life lasts four minutes, seven seconds and features Mohammad Gulab, the Afghan who helped Marcus Luttrell survive along with Berg and Wahlberg. I like the moments with Gulab but the rest falls flat. The disc opens with ads for Non-Stop, 47 Ronin, Ride Along, Endless Love, Sabotage, Scorpion King 4 and Jarhead 2. Previews adds promos for Contraband, Safe House, End of Watch, The Place Beyond the Pines, The Debt, Tinker, Tailor, Soldier, Spy, Schindler’s List and The American. No trailer for Survivor appears here. As a war movie, Lone Survivor brings us a firm “B+” effort. While it doesn’t offer anything novel or especially creative, it boasts the brutal battle experience it needs to succeed. The Blu-ray offers terrific picture and audio along with a disappointing collection of supplements. Survivor breaks no new ground but it still achieves most of its goals.